Any director in charge of summer camp programs knows how difficult it can be to gather information and organize records for each camper. JotForm’s Camper Information PDF Template makes it easy. After you customize the template to your liking, it will instantly transform camper information into secure PDFs that you and your camp staff can pull up at any time, whether during an activity or an emergency. 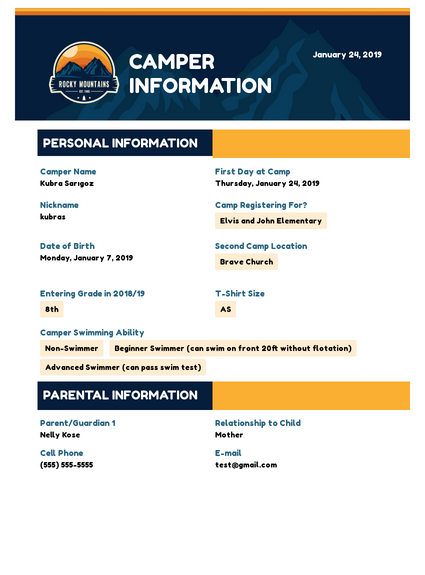 This template asks for information about campers, parents/guardians, and payments. Using JotForm’s PDF Editor, you can including additional information fields, rearrange layout settings, change the header image, or add your camp logo. Submitted information is saved as easily accessible PDFs, making data collection a walk in the park. Where would you like to be reached while your child is at camp?